There’s been a big growth in summer mountain tourism over the last ten years and it’s no surprise why. With so much on offer, a summer holiday in the Alps is a fantastic alternative to the traditional beach experience and Morzine offers some of the biggest opportunities for individuals, families and couples to enjoy the surroundings and some of the activities on that are available. Firstly, you could just opt for enjoying the beautiful landscape and Alpine scenery – taking advantage of the Multi Pass scheme that provides lift access (and many other activities) for just €2 per day, whisking you up to the peaks where you can hike, bike or enjoy a meal at one of the numerous mountain restaurants. The world class sports centre has an Olympic size pool, and a smaller kids one too, or swim in the nearby Lac Montriond. There’s horse riding, forest adventure parks, summer tobogganing, weekly markets, dedicated children’s weeks and live music events. Let’s not forget one of the biggest draws – world class mountain biking and road cycling. Morzine has lift accessed trails for all levels of mountain biker and some of the most famous climbs of the Tour de France, the world’s biggest long distance cycle race. Morzine is a summer mountain paradise and if you love the mountains during winter, then a summer holiday is a must have on the tick list. Here’s a list of some of the events and festivals that are happening over the summer of 2018 in and close to Morzine. Two cycle races of 155km and 100km over the Joux Verte, Corbier, Grand Taillet, Jambaz and the famous Joux Plane cols to finish off in Morzine town. Major mountain biking festival that attracts thousands of visitors from around the world. Lots of competitions and events going on through the week and star riders to look out for. 200 Porches participate in this classic rally with more than 400 other Porsches joining the fun in Morzine alongside the participating vehicles. The Pass’Portes is a major mountain bike event taking place in the Portes du Soleil resorts spanning France and Switzerland. 80 km of routes with lots of pit-stops serving up local specialties. 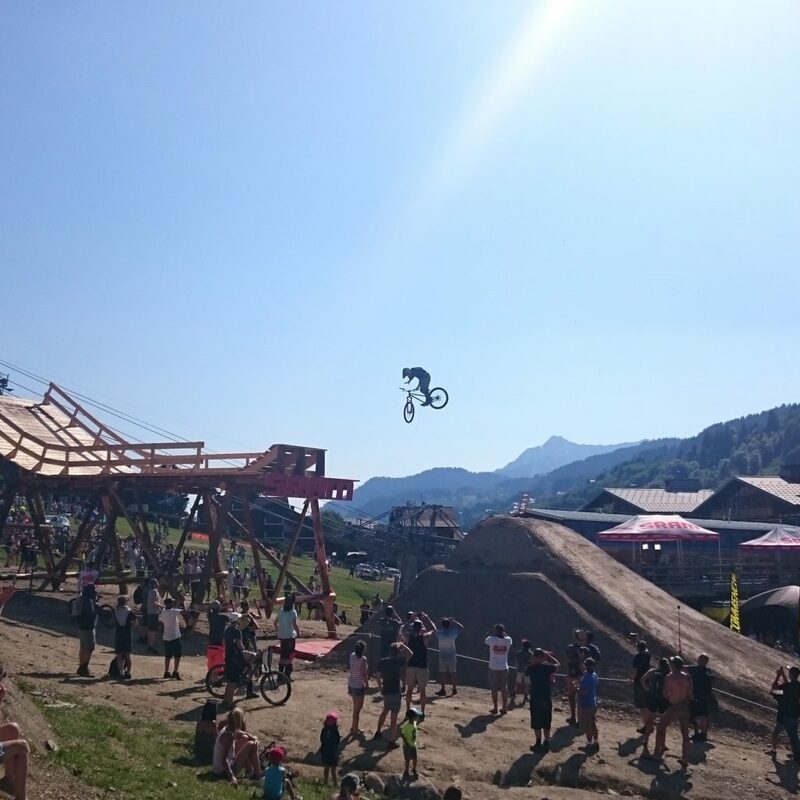 There’s also a bike show held in Morzine with more than 200 international brands and free bike tests. The 6km race includes approximately 20 obstacles on a trail which takes competitors across and under logs, gaps and other placed climbing obstacles and also irregular terrain with potentially hidden natural challenges, water and slippery surfaces. Sounds fun! Loads of activities and shows for children in the town centre of Morzine through this dedicated kids week. The best riders in the country compete on some of the world’s best mountain biking terrain in the downhill – fast action packed mountain biking with undoubtedly some big air thrown in. The beach is brought to Morzine, along with games, live music and of course plenty of sand. This trail running race from Morzine to Avoriaz offers beautiful views of the Portes du Soleil while racing around the Hauts-Forts, the highest summit in the Chablais and the Portes du Soleil. Get involved, or just watch! Most of the events are open to anyone, but perhaps you arent up to the rigours of downhill biking or trail running. All the events are spectator sports too, so you can get out into the town for the finish and soak up the atmosphere.